Yes we’re still here, and yes we’re still editing this important film. In the meantime we present to you a brand new trailer. Drop us an email and let us know what you think! Citizen scientists, an overdue dispatch from chilly Chicago and balmy South Florida. First, the elephant in the room: we’ve fallen behind and will not make our original goal of completing the film before years end. 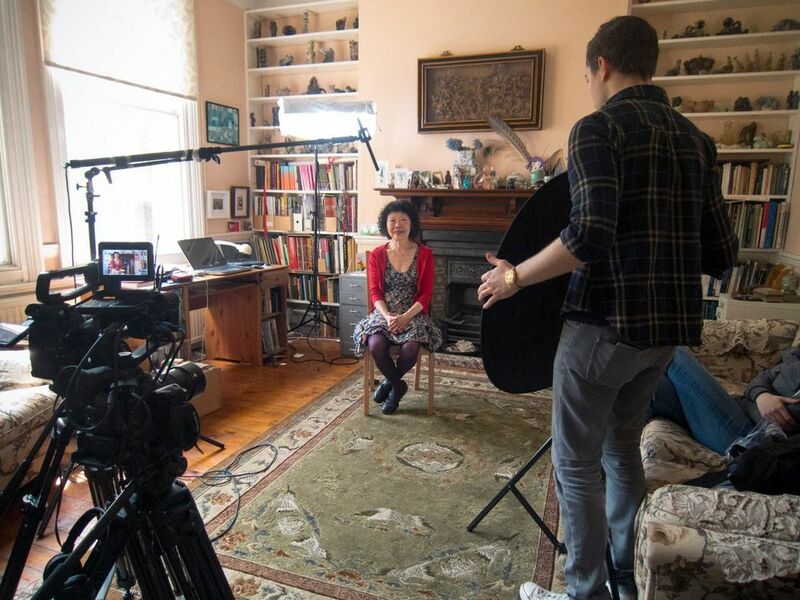 With over 100 hours of interview footage, more elements still to shoot, a thousand archival clips, and an incredibly complex and delicate story, the project proves to be a monumental task. But we are making steady and purposeful progress, of which we shall illuminate below. Throughout this journey, the story has taken all manner of twists and turns. With such wide-ranging and high-level content, finding a focus and sticking with it is of utmost importance to telling this story in an impactful way. Through many a late night discussion, we've found that the most compelling narrative threads are bigger picture and higher concept, as opposed to detailed biology, practical treatments, and nutrition. New scientific studies and nutritional recommendations change constantly, but the philosophical thought underpinning them are timeless. We want to make a film that stays relevant for a decade, rather than a few months. Meet Glorily! Our editor, and coincidentally also Jeremy's wife. Just one of our chapters, totaling 6 hours before editing it down to 20 minutes. Workflow for syncing a multiple camera interview set-up. Further refining one of the chapters. Hi Ray! Part of the Tiger team. Assistant editor, editor, producer, and executive producer (the baby). Color-grading clips for the blog. What if our fundamental knowledge of the workings of life is wrong? 2. Before directly tackling this question, we introduce our cast of maverick interview subjects, spanning all spheres of science and medicine. We hear stories of their various rejections from the scientific establishment because of their unorthodox findings. What if there is an alternate model that more accurately and elegantly describes life? 4. A host of scientific breakthroughs tell the story of a less genetically determined, more environmentally influenced biology. This more positive and productive picture of life, from the cellular level up is woven together through animated sequences and recreations of experiments. 5. If this new model is even partially correct, our understanding of disease, aging and nutrition must be radically reconsidered. Doctors and scientists present breakthrough research on cancer, depression, stress, heart disease, nutrition, and more. We end with a message of self­-responsibility and self­-empowerment, rather than submitting oneself fatally to one’s genes. Through self­-education and self­-experimentation we can regain authority over our own health and well­being. We thank you all for your patience and leave you with two clips from subjects you've yet to meet. The first is about the danger of reductionism in medicine with Dr. George Slavich, director of the Stress Lab at the beautiful campus of UCLA. The second is with Dr. Matthias Nägele, a cardiologist at University Hospital Zurich, on the influence of financial gain and pharmaceutical research. Back in January we travelled to the Sundance Film Festival in Park City Utah where we binged on a bevy of inspiring documentaries (thanks Curator Pictures). We recommend the especially weird films Tickled and Holy Hell. Sundance Film Festival, Park City, Utah. We continued our journey further South and West to California, where we lined up an eclectic mix of interviewees to film. Our first coordinates were the San Diego area to interview both Kate Deering and Alex Tsakiris. Kate is a trainer and health coach living by the wind-swept beach of Del Mar with her Beagle-Hound, Bugsy. Kate’s training modalities and health recommendations have largely been inspired by Dr. Ray Peat's bio-energetic view of life. Her techniques keep stress at a minimum, meaning she didn’t completely destroy Jeremy during a strength training session for the film. Roving just a few miles North brought us to our second subject, Alex Tsakaris, whose roof had just been smashed in by a giant eucalyptus tree uprooted in a windstorm the night before. Alex, a science critic, is an author and the prolific creator and host of Skeptiko, a podcast covering the science of consciousness. We spoke with Alex about his idea that science is mostly wrong about everything because it fails to acknowledge consciousness into the equation. Our last destination sent us further North, to the small hamlet of Los Angeles. There we filmed with Dr. George Slavich, director of the Stress Lab at the beautiful campus of UCLA. George has 5 degrees and looks like he’s in his 30s, so we’re convinced he’s a robot. We learned about how the effects of social stress can change gene expression and in turn your DNA in as little as 15-30 minutes. The shoot ended with Brad being sucked into an MRI machine to get his brain scanned, all for the love of the documentary. We hope this update satisfies your curiosities until the next. With that we’ll leave you with a clip of the recently departed genius/geneticist/painter, Maewan Ho. We stocked up on german gummy bears at the Stuttgart airport before boarding a flight to London. I think its fair to say Germany has the best gummies in the world. From Heathrow we headed to our next Airbnb, a superb-looking flat off Baker Street, the former setting of Sherlock Holmes. Unfortunately, the man who’d been corresponding as the owner was actually someone else… so we arrived to a home that was currently occupied by a very confused owner. Last minute, we managed to snag some sterile, little rooms at a nearby Tune hotel for the night. We raided the Tesco across the road for snacks and scrambled to arrange accommodations for the rest of our stay. With some luck we found a nice flat in the Queens park neighborhood. Our first order of business was a brief visit to Dr Mae Wan Ho. She was as lovely, optimistic, and energetic as always, despite recent health challenges. We shared some coffee and gluten-free cookies before moving on to readying the rewards she kindly donated to our Kickstarter backers. 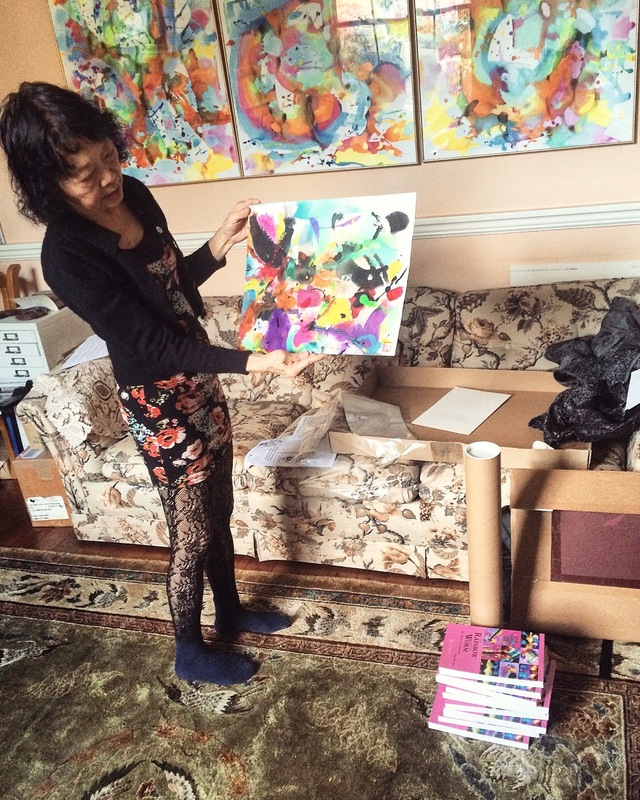 In her study she signed 10 copies of her book Rainbow and the Worm and selected a number of her original paintings. We packed things up, said our good-byes, and headed out to prep for our big shoot the next day. Friendly staff at the Tune Hotel. On the walk to MaeWan's house. "just pretend I'm not here..."
An early train took us past a blur of green countryside before dropping us in the city of Oxford. From the station we loaded up a gritty english taxi that took us to Oxford’s Balliol College Department of Physiology, Anatomy and Genetics building. Where, in the parking lot, we met our interview subject, Professor Denis Noble. He gave us a tour of the deserted building, as we made our way to the library that would be our set for the day. Noble did pioneering work in systems biology and made a mathematical model of the heart in 1960, but mostly didn’t rock the boat until publishing his 2008 book The Music of Life. In it he challenges Neo-Darwinist reductionism and questions the gene-centric story we continue to hear in the media; a sharp contrast to another Oxford luminary, Richard Dawkins. During the interview he spoke about his more fluid view of evolution and about some of the dangers of mechanistic language. He's also one of the most tech savvy 79-year olds we've met, proficient in Adobe Premiere Pro for his self-shot video projects. The next evening, after a little mental recovery, we hosted a London fans meet-up. We were touched again by how far people were willing to travel to get together. It was really great to meet such a big group of like minded individuals from all sorts of backgrounds. Thanks again to all of you who came out for making it such a fun, and surprisingly un-awkward evening! Organic goat sausage by the round tower. We left behind a suspiciously sunny London, as we headed to Copenhagen to meet our next interview subject, Benedicte Mai Lerche. From her home in Denmark, she runs a nutritional metabolic counseling practice called Biochem Nordic. Benedicte chatted with us about her own health journey that led her to the work of Dr. Ray Peat, and how after finishing her PhD in chemical and biochemical engineering she decided to dedicate her time to helping others with their own health journeys. Copenhagen was a blast, but it sadly brought us to the conclusion of a very productive trip. It was amazing to be able to get so many interviews under our belt in one go, thanks to the support of our generous backers. We headed back to the states several steps closer to finishing production. Dear readers, it's been far too long since we've updated, but thankfully the next few blog posts will be substantial. We've just returned from our European expedition, our first since the success of our Kickstarter. Read below for part I in which we speak to a consciousness philosopher, experimental cancer researcher, a health seeker, a cardiologist, and get accosted at Stuttgart's Oktoberfest. First stop: Netherlands. After a too brief-sojourn in the ultra-pleasant city of Amsterdam (and being gifted a Blake book by a fan, thanks Moon! ), we boarded the train for Eindhoven, Holland's "silicon valley". There we were met by a generous backer/Google engineer/comedian/occasional crew member/brain-truster, Ibrahim. After he saved us from an equipment rental disaster, we headed to the neighboring village of Veldhoven, home of our first subject, Bernardo Kastrup. The importance of being stocked with snacks. Carting around luggage and gear all day never gets old. Bernardo is currently a writer and philosopher on the sphere of consciousness, but his beginnings were headed in an entirely different direction. He peaked at a young age, landing a job as a technologist at that bastion of scientific materialism, CERN's Large Hadron Collider. At first he couldn't have been more content, but something was gnawing at the equilibrium of his psyche. There were glaring flaws in materialist science, especially the prevailing perspectives on mind, brain, and consciousness. These seeds of doubt have grown into his current passion: writing and speaking with a razor sharp articulation of what a non-materialistic view of consciousness, and the universe, looks like. Our next vector was Stuttgart, capitol of Germany's Baden-Württemberg state known for it's abundant mineral hot springs and spas (of which we didn't partake) and the 2nd largest Oktoberfest on the planet (of which we may have partaken). On our first day we had a mini meet-up with some fans of the film at our Airbnb, with people traveling from Zurich, Frankfurt (hi Phyllis! ), and a nearby village. 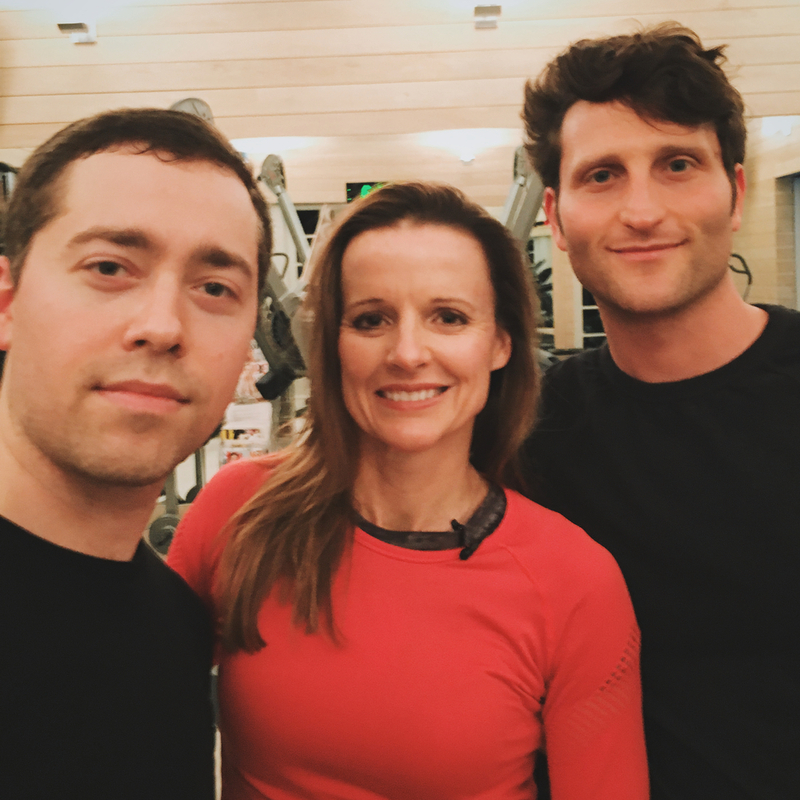 We even sweet-talked our way into interviewing two of them: Amanda Jane Wood, whom through self-education and experimentation has radically improved her own health, and Matthias Nelke, a brilliant soon-to-be cardiologist who's practice is inspired by some of the scientists and ideas in our film. But the reason we traveled to Stuttgart was for the legendary (at least to us) Dr. Gershom Zajicek. Gershom was the former head of experimental cancer research at Hebrew University, Jerusalem, as well as a practicing Oncologist. He has a completely radical point-of-view on how cancer develops (it's not genetically determined), how to treat it (minimally invasive), and even how it should be talked about. It's a paradigm that is much less barbarous, and much more effective and humane than what prevails today. In his other life he's a bioinformatics pioneer and brought digital computing into Israel. On the way to lunch we happened upon an accordionist preforming on the street. Gershom sidled right up to him and started belting out an Italian operetta to the cheers of passers-by. 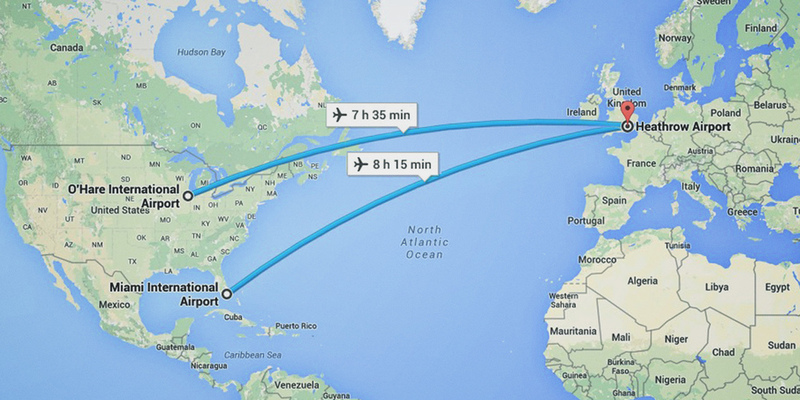 Stay tuned for part II in which we head to London, Oxford (yes, really), and Copenhagen. A big THANK YOU to all our backers and everyone who shared. 562 people helped us raise 213% of our original goal. This will allow us to get well into post-production, independently. Many more updates to come. But for now, bear with us as we catch up on some sleep. Each week of our Kickstarter Campaign we've released a new teaser featuring one of our interview subjects. So far we've released videos for Dr. Harold Hillman, Prof. Gerald Pollack, Dr. Gilbert Ling, and Dr. Raymond Peat. Stay tuned for more! Dr. Harold Hillman on the living cell. Prof. Gerald Pollack on the fourth phase of water. Dr. Gilbert Ling on his unifying theory of life phenomena: The Association Induction Hypothesis. Dr. Raymond Peat on how a whole society can shift consciousness. We're ecstatic to finally launch our Kickstarter campaign. If this campaign is a success, we'll be able to finish production and start on a rough cut. We'd be gracious for any donation you can afford. Please share this link with anyone you think would be interested in supporting or sharing. We are pleased to share this trailer of our progress so far. If your interest is piqued please sign up for our newsletter below. 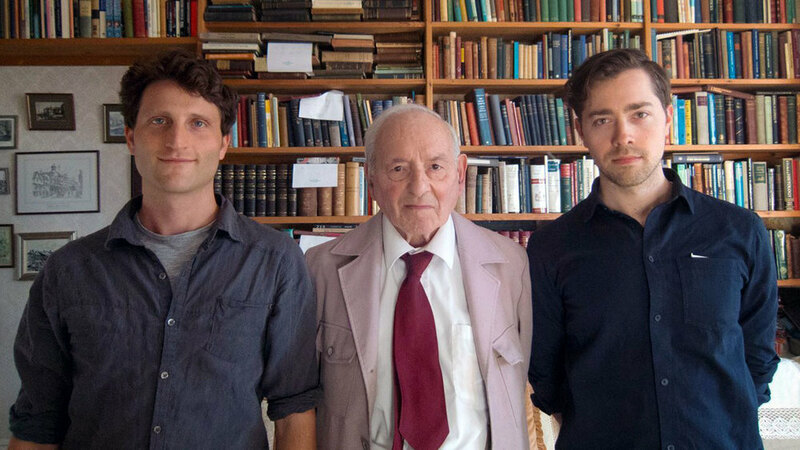 We never thought we’d get this far, meeting and filming the elusive genius, Dr. Raymond Peat. Our original idea was to make a documentary focusing solely on him, but he inspired us to widen our scope, ultimately starting the journey that led us here. It’s extremely difficult summing up Dr. Peat: he has a Phd in biology, written endlessly fascinating books and newsletters on every conceivable topic, and helped scores of people with their nutrition and ailments. He’s inspired a cult-like following on the internet (which we later learned he’s completely unaware of). At 77, he’s appeared on video only twice, and never in a formal interview. From the start, we knew it wouldn’t be easy, we’d have to gain his trust. And after nearly a year of trying to schedule a shoot, we were ready to give it up. Then, in October we were on the west coast filming Danny Roddy, so we thought to ask Dr. Peat one last time. To our amazement, he agreed. From Ray's University professor days. Giddy with excitement, we rented a van and began the long drive north, from San Francisco to Eugene, OR, a pleasant University town. We checked into our Airbnb, a little mid-century modern bungalow, where we decided to shoot the interview. Ray came by the next day. We sat in the backyard in the late-morning sun and chatted for a while (he was particularly interested in the activities of a little squirrel). It was a surreal experience to be casually conversing with someone we’ve read so much about, learned from, and have been inspired by. But the conversation flowed easily. We moved inside for the interview, and over the next two days logged about 10 hours of dialogue. His stamina for speaking impressed us. When we asked about it Ray related a saying, that only Fidel Castro and Buckminster Fuller could speak for longer than he could. We heard about his own journey to health, including an ill-fated nutritional experiment that destroyed his teeth back in the 50s (short story: don’t try to live off wheat germ). Other topics included the nature of biological energy, nutrition, hormones, dogmatism and authoritarianism in the scientific and medical establishment, his influences (including Ling, Ho, Hillman, Pollack), and how seemingly “new” ideas and discoveries are rooted in very old research. Ray made the point that he considers himself a painter more than a scientist, and in fact, drew our portraits the evening of the 2nd day. They were his first portraits in 30 years. Coincidentally, it was my Birthday, and I couldn't think of a better way to spend the day. A Peat original, gifted to Jeremy. "Is that even a real name?” is usually the first question we get about subject #7, Danny Roddy. From his San Francisco Mission District HQ, Danny blogs to a hungry audience on all matters health and nutrition. But what sets him apart from the horde is the unique ability to understand the hard science, and then relate it in an easily digestible way for the lay person. Danny was our first non-scientist subject, and was at first unsure about appearing on camera. To help ease the fear, we met up with him the night before for a drink in his neighborhood. Being fellow health weirdos we got along swimmingly from the get go, swapping stories of our niche diets and self experimentation. We started the interview hearing about Danny’s own health journey. In his early 20’s he played bass for the band Takota. The future looked bright, but the touring life wreaked havoc on his health. He struggled with stress, with loss of both his libido and hair. His experience with the medical establishment left him even worse off, and thus inspired him to take his health into his own hands. He spoke about the work of Ho, Pollock, Ling, and Peat, and how they sparked his current focus: a novel approach to treating hair loss with lifestyle, nutrition, and supplementation. After the interview (and a brief guitar serenade) he demoed how to make Peat's famous intestinal-cleaning carrot salad. In the early eve he took us grocery shopping, showing us the various items he eats to keep his metabolism buzzing. By the end it was clear that what separated Danny from the other blogger-gurus out there is his non-authoritarian approach. He stresses that for one to be successful in matters of health, they must inform their own decisions. Danny may also be the only person on the planet that eats ice cream solely for the health benefits, not enjoying the taste. And yes, it is his real name. We'd criss-crossed the continent for our previous 5 interviews, but our 6th placed us right in the heart of Jeremy's home state of Illinois. In our sights was Dr. Fred A. Kummerow, Professor Emeritus at the University of Illinois in Urbana-Champaign. We can thank Fred for the now widespread understanding of the harms of trans-fats, after he tirelessly crusaded against them for 50 years. Fred had also mentored Professor Chris Masterjohn, wunderkind of cholesterol and lipid research. Chris, pick up your mail. After a mini road-trip down to Urbana the night before, we met him at his home for a little filming and lunch. At 100 years-young, Fred (or Kummy as we affectionately call him), is the oldest of our interviewees. He’s in a wheelchair now, but only because of an injury while partaking in a daily swim at 97. We were struck by how nice his skin looked at that age, almost zero “age-spots” (possibly related to his avoidance of polyunsaturated fats but more on that later). We had a tense beginning (we learned you don’t keep a centenarian waiting), though he soon warmed up to us and we had an enjoyable lunch. He follows a fairly routine diet of an egg, fruit, meat, milk, and vegetables, avoiding fried food, PUFAs, and trans fats. We conducted our interview at his lab in the Comparative Biosciences Department of the College of Veterinary Medicine. The lab was built during the early days of the Cold War, and because of limited funding and his unpopular research, hasn’t changed since. We chatted about his early research and experimentation which linked artificial trans-fats to heart disease and his life-long battle with the FDA to get their use regulated. We touched on the never-reported side of his research, that polyunsaturated fats (including fish oils, flax, soy, canola, etc..) are just as bad. He also illuminated many of the misconceptions of the role of cholesterol in physiology, including it's protective effects. Even at this age, he’s still on the cutting-edge of research, working on a novel treatment for Alzheimer’s and Parkinson's related, related to the ills of the above-mentioned fats. It’s a novelty being called “kids” in your 30s. Thanks Fred. Our trip to see cognitive neuroscience researcher, Dr. Michael Persinger, took us to Sudbury, Ontario, Canada. Brad and I met in Toronto where we rented the rest of our gear and a car. We made the five hour drive to Sudbury, the home of Laurentian University. Persinger is both a professor and director of the Behavioral Neuroscience department there. His office has been in the basement since 1971. When possible we like to see our shoot location before hand. So we were happy Dr. Persinger agreed to meet us the night of our arrival. We met towards the end of his work day, which was around 1:00am. He usually wraps his day up by three or four in the morning. He does this 6 days a week, and has apparently kept it up for decades. The Behavioral Neuroscience department inhabits a collection of windowless, mid-century looking basement labs and offices. The late hours of work and setting made it seem that much more clandestine. The most character is probably revered for his impressively cluttered office, where we conducted our interview. He and his staff took us through their current experiments conducted throughout the building. One of the most famous rooms (probably on the whole campus?) houses his old experiment, dubbed “the god helmet”. Though it's somewhat primitive compared to their current work, the room has an interesting history. It's hosted a vast number of international journalists and well known characters including Richard Dawkins. The lab as it was in the 70s is largely preserved, almost like a museum. They still receive around a hundred interview requests a year on that subject, but most are turned down. He told us frankly that he accepted our request precisely because we weren't focusing on the "god helmet". Our line of questioning cycled around their findings on the effects of EMFs on consciousness and disease. We also asked about the department’s interdisciplinary approach to its research, spanning psychology, biology, chemistry, and more. He's been forced to self fund most of his research, so he also had much to say on the difficulties of doing things unconventionally. Look out for a more complete teaser from this interview soon. Oj, carrot, and cheese for the road. 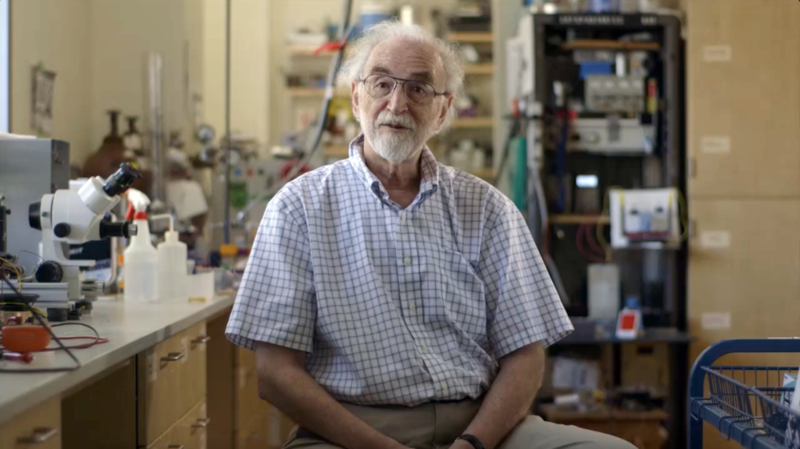 Our fourth shoot brought us to Philadelphia to interview the granddaddy of renegade biology, Dr. Gilbert N. Ling. We lucked out with an AirBnb in a wing of a historic mansion in the beautiful Mt. Airy neighborhood. We also had the pleasure of sharing the space with a family of friendly cockroaches. 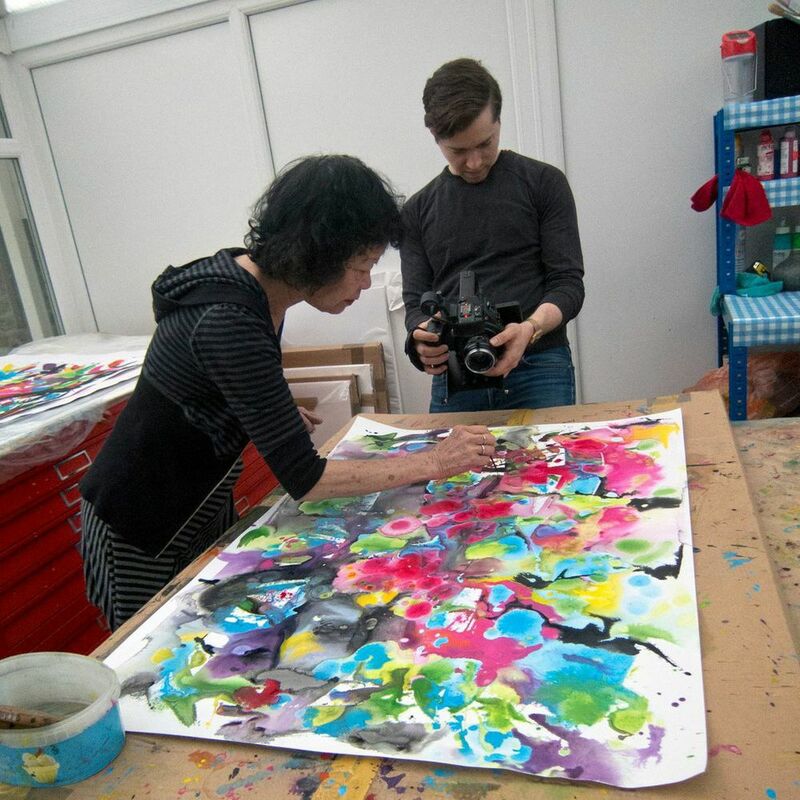 We spent two full-days filming with Dr. Ling, capturing over 10 hours of interview footage. At the age of 95 his mind is razor sharp, energy levels high (we had to run to keep up with him), and completely independent, living in a rambling 3-story house by himself. Our interview focused on his radically different model of the living cell, one that solves the most glaring issues of the standard model. We also touched upon his incredible personal story of how he came to live in the USA, his invention of the industry-changing Gerard-Ling micro-electrodes (of which his name is now erased), and how we have his theories to thank for MRI technology. We also learned a little too much about his own personal experimentation to cure his constipation. TMI Gilbert! We headed to Seattle, in search of the "water wizard" himself, Dr. Gerald Pollack. We stayed in a self proclaimed “funky” Airbnb home in Seattle’s Fremont neighborhood, which put us close to our shoot locations. The first of which was Dr Pollack’s lively lab, located in the Bioengineering department of the University of Washington. He made time for us to spend a good portion of two days filming him. We interviewed him at the lab about their ongoing research into the complex nature of water. He explained some of the wide reaching implications of their findings and showed us some potentially groundbreaking technologies. He also touched on the hardships of pursuing research in unpopular “fringe” areas and how difficult it can be to operate in the confines of sometimes conservative institutions. Later, at his beautiful home, he spoke about his inspirations and his philosophical approach. Which seems to ultimately be about unraveling the simple truths of nature. His house, which overlooks the water, is often used as a gathering place for his close knit group of staff and colleagues. We were lucky enough to be invited to attend one of these warm gatherings at the end of our visit. After weeks of research, planning, and difficult decision making (like "Which lenses do we rent!?" and "Should we give up!? "), we set off to meet in London and shoot the first few interviews for the film. We found a great airbnb in the East End, which we made our headquarters for the next 10 days. After getting settled and figuring out where to source the rest of our gear, we headed by train to Guildford, to the home of Harold Hillman. We interviewed him for two days, covering many topics, including his issues with traditional microscopy, observing the living cell, and how he’s been punished for his heretical views. A summation of his history alone is humbling. He was a founder of Amnesty International, produced research which ended the death penalty in several us states, and continues to write books on his biological studies. It was inspiring to spend our first shoot with such a sweet, humble, and intelligent man. 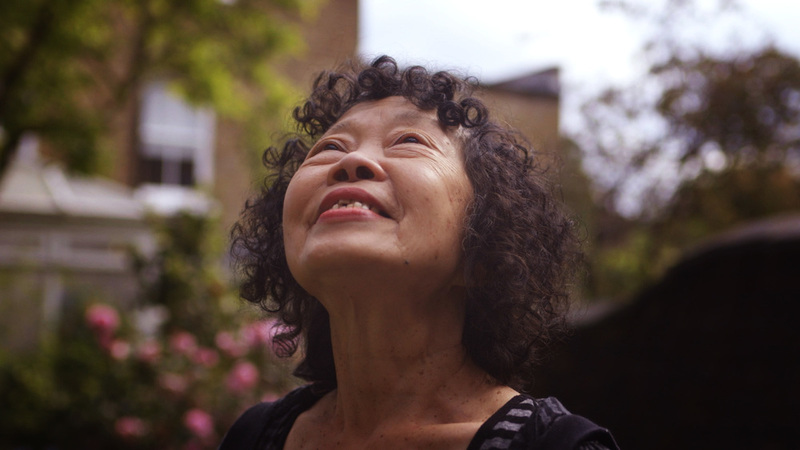 After a day of recuperation we went to film with Dr Mae-Wan Ho, at her London home. She spoke to us about everything from the nature of water, quantum coherence, issues with genetic engineering, and her art. 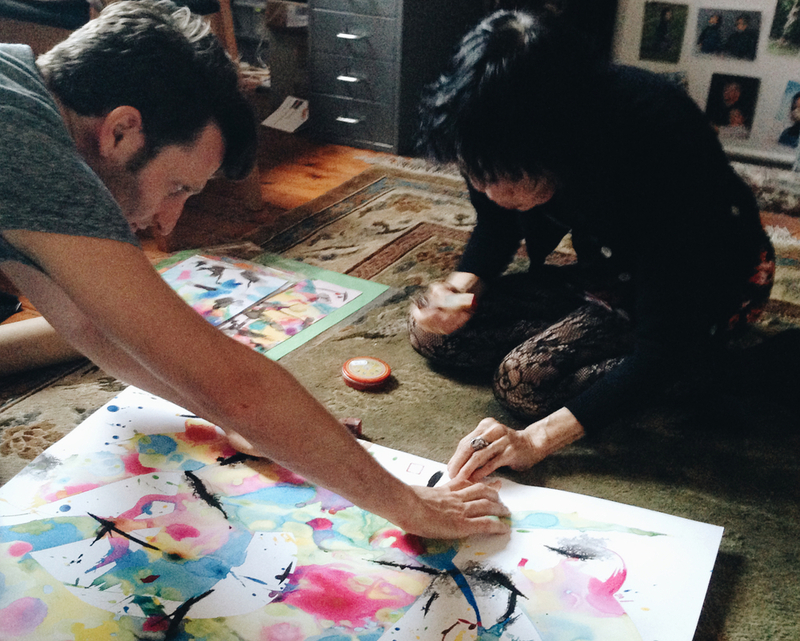 We managed to convince her to do a painting while our cameras observed. She has a Ph. D. in Biochemistry, has authored ten books, and is director of the Institute of Science in Society. There’s some great interviews with her on youtube worth checking out. Before having to head home we also made a stop by William Blake’s grave and sat down for a chat with Phil from Pranarupa. Welcome to the production journal for On the Back of a Tiger. A film painting an alternate picture of the workings of life, and it's profound effect on the nature of disease, aging, nutrition, and consciousness. We’ll be updating with production stills, behind the scenes, trailers, teasers, and details on progress.